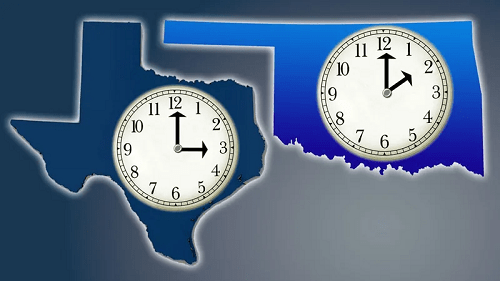 ADA, Okla. — Texomans could soon find themselves in different time zones — depending on which side of the Red River they live. A bill is making the rounds at the Oklahoma Legislature to keep Central Standard Time on the clock all year long. It would also mean that Texas and other states bordering Oklahoma would be in a different time zone for most of the year. “I prefer the Daylight Saving Time just because we have more daylight hours in the day, and you don’t get off work and it’s dark,” said Ada resident Teresa Tweedy. Amanda Walker also favors year-round Daylight Saving Time. “Every time I drive home, it’s dark, which necessarily isn’t bad, but I wish it would stay lighter, then I don’t have to leave in the dark,” she said. House Bill 1117, sponsored by state Rep. Kevin West (R-Cleveland County) will be considered during the coming legislative session which begins on February 4. The proposed bill would take effect on November 1 if it passes. A bill to adopt Daylight Saving Time year-round in Oklahoma died in committee during the previous legislative session.